Chicago architect Helmut Jahn has sent a hand-written note to the Chicago Tribune condemning the selection of a team led by Jeanne Gang to design an extension to O’Hare airport, describing it as “premeditated” and “not justified”. Jahn deplored the decision taken by Chicago mayor Rahm Emanuel in the note sent to the newspaper’s architecture critic Blair Kamin, who then posted a photo of it on Twitter. 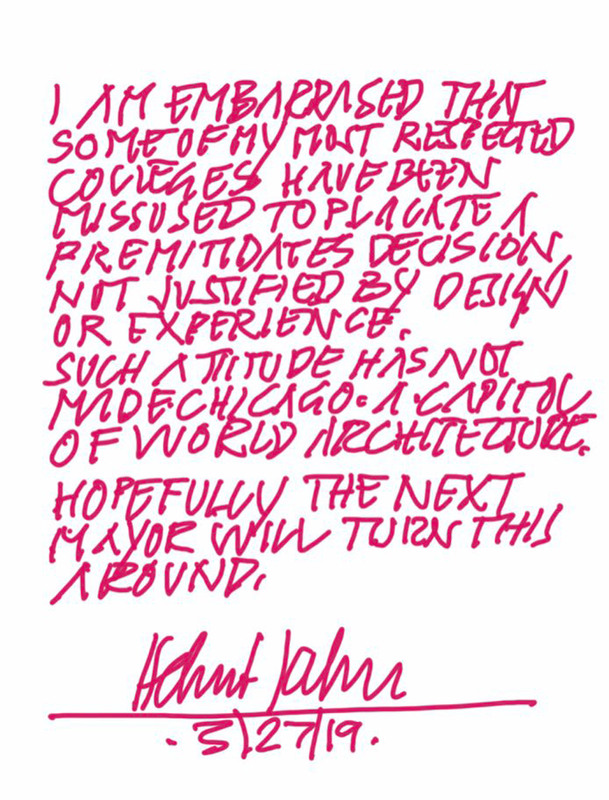 “I am embarrassed that some of my most respected colleagues have been misused to placate [a] premeditated decision not justified by design or experience,” read Jahn’s letter, which was written in all capitals using magenta ink. “Such attitude has not made Chicago a capital of world architecture,” it continued. “Hopefully the next mayor will turn this around.” Jahn then signed and dated the note. Gang’s team, called Studio ORD, comprises Chicago’s Studio Gang, Solomon Cordwell Buenz, Corgan, Milhouse Engineering and Construction, and STL Architects. It was announced as the winner of the competition for a new concourse and terminal at Chicago O’Hare International Airport on 27 March 2019, beating competitors including Foster + Partners, SOM and Santiago Calatrava that were shortlisted earlier this year. 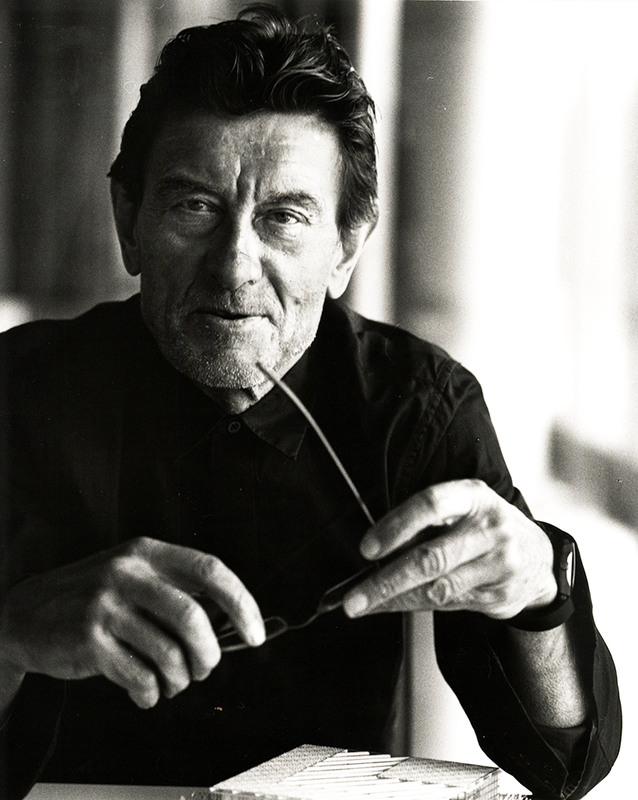 Jahn, who designed the 1987 United Airlines Terminal One at the same airport, is skeptical as to whether the jury’s votes for Studio ORD’s proposal took this into consideration, with his note implying that the selection process was unfair. He was also critical of the city’s mayor Rahm Emanuel, who previously served as White House Chief of Staff during Barack Obama’s presidency. The mayor, who has held office since 2011, has been under harsh criticism during his time in office, with low approval ratings. Jahn sent the note following Kamin’s request for a comment for an upcoming story. The piece, which was published in the Chicago Tribune, highlights the difference between the public’s preference and the final decision given to Studio ORD. “In the city’s own online survey of more than 41,000 Chicago residents, travellers and architecture buffs, Gang’s design for a curvaceous, Y-shaped terminal that would replace O’Hare’s existing Terminal 2, came in third in a field of five, well behind plans from Zurich-based Santiago Calatrava and London-based Norman Foster, both of whom have far more airport design experience than Gang,” said the article. While Kamin commended the “extraordinary talent” of Jeanne Gang in the article, he added that the team’s design didn’t “soar” in comparison to the others. Among the critiques of Studio ORD’s Y-shaped airport design is its similarity to Calatrava’s Oculus at the World Trade Center in Manhattan. Matching features include an Oculus, for the main concourse lounge, and a roof layered in slats and skylights. These include Cameron Sinclair, the former head of social innovation at Airbnb, who tweeted that Jahn should “take a flying leap”. Her moves include closing the gender pay gap at her firm Studio Gang, and calling for others to follow suit to “fix pay inequity”. The architect’s more recent works include the 1000M skyscraper designed for the city’s South Loop. The post Helmut Jahn writes magenta note attacking “premeditated” selection of Studio Gang for O’Hare airport expansion appeared first on Dezeen.